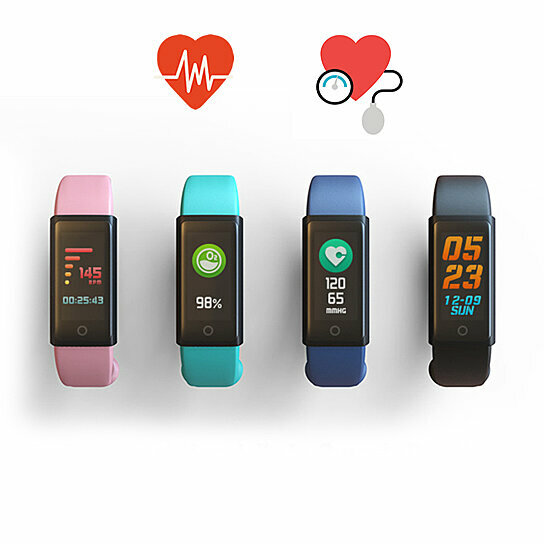 Life is full of colors like a Spectrum, get a Smart Fit Watch that has Colorful OLED screen a Live Herat Rate and Blood Pressure Monitor. Experience the Spectrum and stay in the best of health always! Monitor all motion and activities in colors. Keeps track of heart rate 24 hours a day. Monitor your Blood Pressure on demand with a 7-day history stored in your App. Monitor sleep pattern has a sedentary alert function. Also has Time and Date. Step pedometer and distance tracker. SMS alert and alarm alert.Sophisticated Bluetooth technology (4.015) allows the watch to sync with your Apple or Android device via a health-tracking app available for free in the iTunes App and Google Play stores. Calculates calories burned based on activity. The pedometer tracks your steps via the app. To charge the Spectrum Watch, remove one side of the band to expose the charging pin. It comes in dynamic colors like BLACK, MINT, PINK, and BLUE.